I have been trying to getting used to skeinforge for some weeks now, after been using slic3r for some time.. So.. is there a "hack" or some function I could use to get a "slic3r" behavior from my fan ? 1) the fan will only work during orbiting cooldown period. 2) orbiting is problematic because it let time for nozzle oozing. It maybe possible to make it work by combining with "Wipe" module, but I didn't investigate that. If someone wants to hack the cool module, it would be nice to add a third cool method, "FAN" (trigger fan if layer time is below "Minimum layer Time (seconds)"). 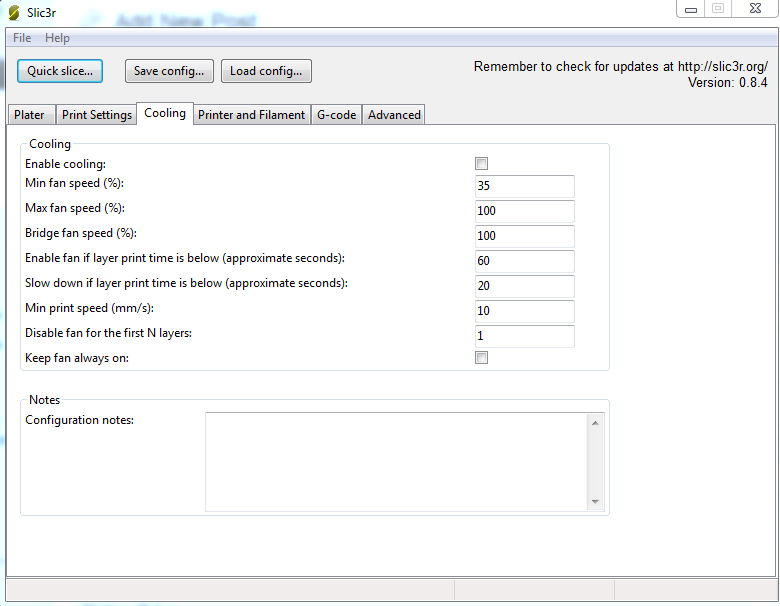 Or even better keep using the slowdown method as is ; and add a couple of times parameter "Max layer time for fan" (minimum speed of the fan, fan is off if layer printing time is longer than this) and "Full fan speed layer time" (any layer shorter than this will have fan running full speed). The PWM - when available - would gradually adapt fan speed between those 2 boundaries. Fan on during overhanging layers would be more useful. I don't need a fan for small layers, I just slow right down to a standstill but I can't do anything with convex of concave overhangs because the edges curl upwards. nophead idea is good, but in the meantime I did it as I first described, if someone want to test... No warranty. Backup your original cool.py, and replace it with the file attached (renaming it to "cool.py") (and remove the cool.pyc if present). Oh, you also have to untick "Turn fan on at beggining", I made my change only apply if this is not enabled. Next enhancement would be "No fan before..." Should that be layer X or height Z mm ? And then I'll turn to overhang detection, which I have not a single clue how to achieve currently. I'll study how the bridge detection is done, maybe I could cook up something similar. Edited 1 time(s). Last edit at 08/22/2012 08:12AM by B4Me. Here's another version, with the "do not use fan before layer n" option. But fan or additional cooling for bridges is "cool". Ahmet, thanks for the info, will help. B4me, what is the source for that fan duct ? I might consider making myself one. > Ahmet, thanks for the info, will help. > might consider making myself one. Here's a first step toward Nophead's request, new version use the bridge detection of the Inset module - you must activate "Infill in direction of Bridge" there first. Then you can tick the new "Force Fan on Bridge Layers" box in Cool. 1) if "Turn Fan On at Beginning", well then fan is always on. 2) if "Force Fan on Bridge Layers" and layer is detected as a bridge, fan is activated. 3) after that only, "No Fan use before Layer" is checked. Yup it means even second layer will get some air if it's a bridge. 4) then the max and full speed duration of layer settings apply to calculate fan speed (and the time used here is the duration of the layer before cool slowdown is applied). I haven't had any luck with this download. It would really be nice to be able to turn on the fan either after or on the x'th number layer- especially if that could be integrated into repetier host some how. Doesn't Repetier host come with Slic3r nowadays ? 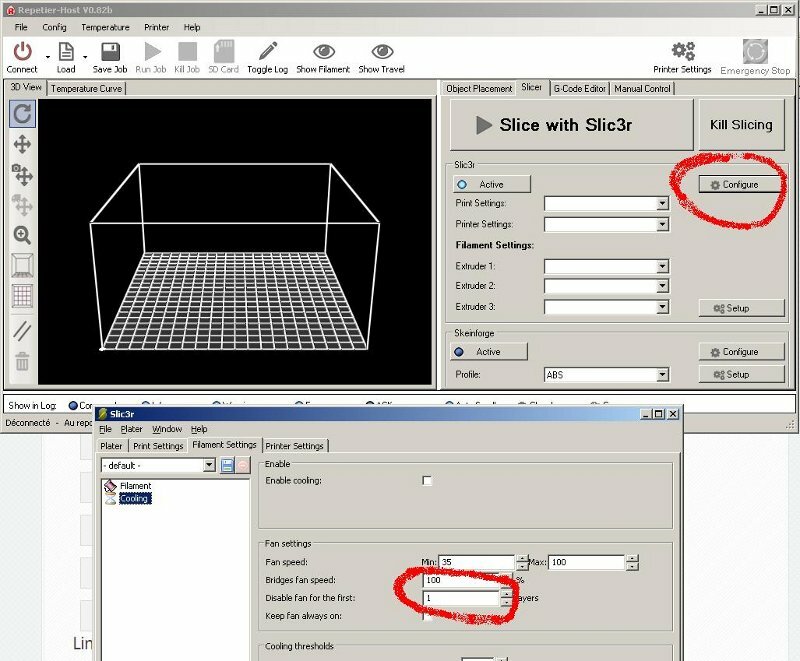 And I believe Slic3r have that feature. I reckon that's a lot of belief and guess. 5 minutes and a few mouseclicks later : belief and guesses were right. Ok, then explain what is your problem with my modified skeinforge plugin "cool_fan_control_3.py", I have had the occasion to test it now so I can confirm it works and maybe we could help you. Hi DeuxVis and THANK you for such great plug in. I was testing bridging today, and I had a bridge lower than the "No Fan use before Layer" and the fun did not start. I tested it only once though. Just wanted to let you know. I really like your variant of the cool plugin. But I missed one setting and therefore I modified it a bit. Now it is possible to set the maximum fan speed. In my case all the settings were as desired but full fan speed was just too much. Futhermore i changed the layout to have the priorities of the fan settings clear. It always seems to use 200 for the fan PWM value regardless of what is in the text field. It gets saved in the file but it always returns to 200 when the settings are loaded. Looking at the code I can't see any reason in the code as it looks the same as the other integer fields. Wasted hours tracking that down. nophead, that's strange, it did not affect me - I'm 100% positive on that as my fan will only buzz instead of turning if you give him anything below 255, I would need to give it a capacitor in order to work on PWM. Thanks for reporting your findings anyway. Are you using Joost-b's version or your own? I was using mine, sorry for the misunderstanding. A new version with a new setting : minimum movement speed when using slowdown cool type. Sometimes extreme slowdowns seems to be more harmful than helpful (for instance when printing the top of a pyramid). Edit : oops nearly forgot to do it, while I was on it, changed the caps thing as reported by nophead. Edited 1 time(s). Last edit at 12/11/2013 11:53AM by DeuxVis. I never had many successes in printing small parts. 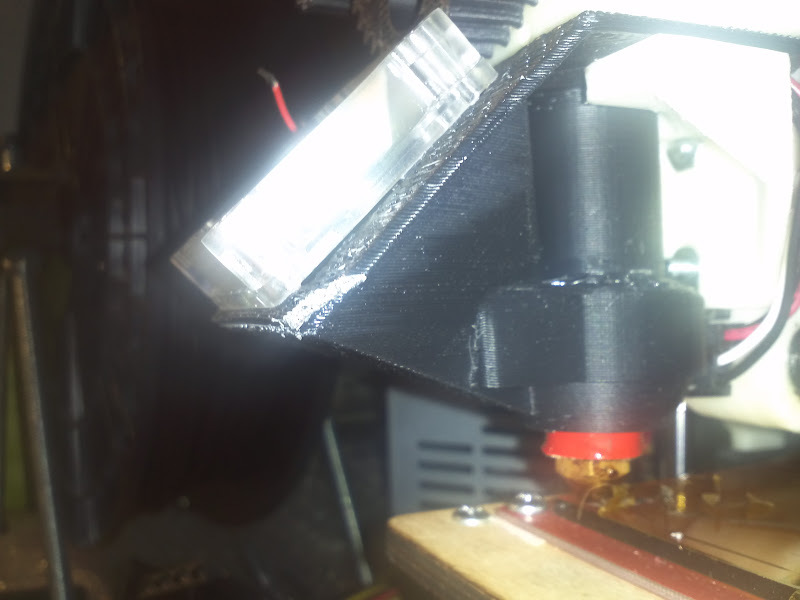 Really when I print pieces less than 0.5x 0.5 cm PLA melts down. - ORBITING / MOVING HEAD to loose time. > very bad experience: the print becomes SLOOooooowwww..., and the nozzle starts to oozing and then the print quality is lost. 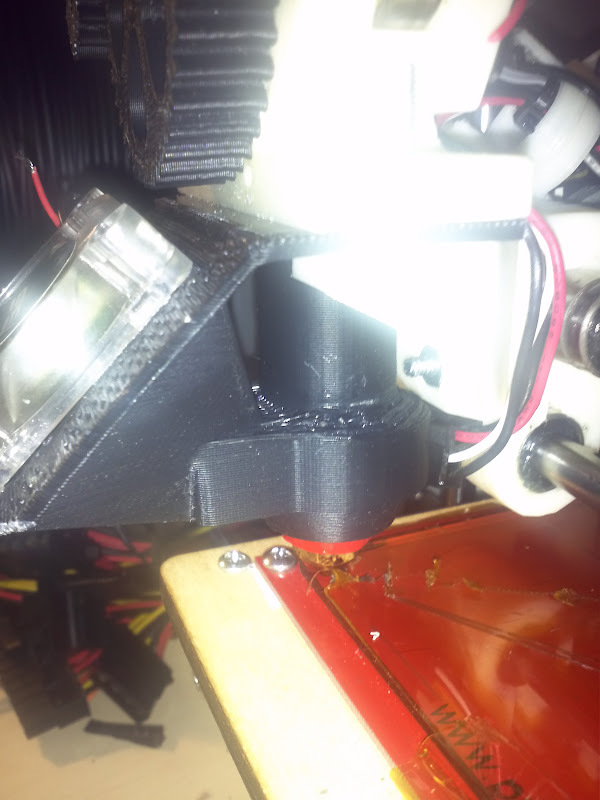 No way to step back the filament, because then it will create issue starting the new layer. I put 2 (!) 10 cm fan; one on top pointing the air flux on the center of the platform (air top->down center) , one on left pointing the flux at the center of platform (air left->center) and a BIG VORTEX FAN 50 cm away pointing to the printer, trying to print the famous tower test. > I think I damaged the printer controller board usb (!). In fact the electrical disturbance of 3 motors on the power line, caused the laptop to have continuous disconnect errors (and since then I was never able to have any print without random usb disconnect). Note that the fans were self powered outside the printer power supply, but however on the same home line plug. > improvements on the quality of the print, but not perfect, lot of noise and air. I was using 3 & 1 big fan, and that was just enough to some improvements. * A mini VACUUM device mounted in some manner to the nozzle to create vacuum and prevent plastic to ooze during a cool phase software controlled. I keep you informed of progresses. The top of this prints OK on a Mendel90 [www.thingiverse.com] and that is only a 5mm cube. I just slow down and have a ducted fan. I am not sure how much smaller would work with PLA but if I had to print something very small I would either use ABS or print a sacrificial 5mm tower at the same time located as close as possible to the small bit.